What to Do if Your Cat Has Fleas? Although a mild flea infestation will usually just cause your cat an annoying itch, kittens or older cats are more prone to complications. Any cat that has fleas is also more likely to develop tapeworms, as fleas carry the immature worms and can transmit them when they bite. Treating an infestation of fleas is therefore vital and ideally you should try to prevent your cat picking up fleas. Rinsing your cat with cool water can remove fleas from their coat. Applying a pet-friendly shampoo that is infused with citrus, eucalyptus or lavender may also repel fleas. For cats who dislike water, you can use a flea comb to remove the insects. Fleas particularly like to congregate around a cat’s armpits and at the base of their tail, so don’t forget to concentrate on these regions. It is equally important to remove fleas from your home, as they are found in all areas that your cat goes, so wash all bedding and fabrics. Make sure that you give your home a thorough clean and vacuum regularly. You may also find that salt sprinkled into your carpets is an effective way to dry out eggs and larvae nestled in carpet fibers. 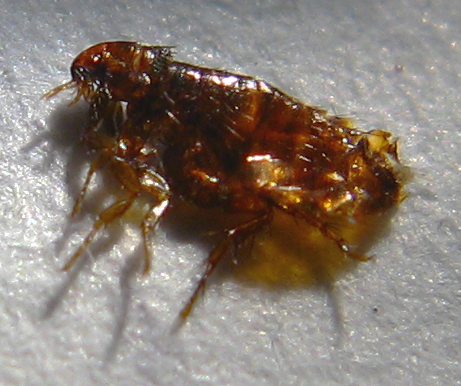 However, for a severe infestation, professional flea extermination is often necessary, so get in touch with Marty if you have a problem with troublesome fleas. If your cat spends time outdoors, your yard may also harbor fleas so avoid unnecessary debris that may attract fleas and also consider plants like lavender, fennel and marigolds that fleas dislike.